Send Premium Roses and Teddy Bear - $75 | Order online with , Ukraine florists. 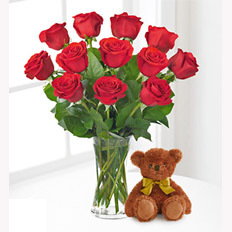 A bouquet of stylish premium red roses with a sweet plush Teddy Bear is a great way to reveal your true feelings. Such gift is the best for a Lady and a Queen! Amount: 11 roses, 1 Teddy Bear. Send premium bouquet of red roses all over Ukraine with us. Courier same day delivery service has been at your service since 1999. The best florists and online help is available for you.